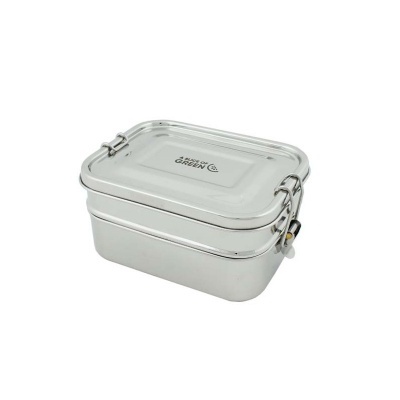 A leak resistant two tier steel lunch box with a removable silicone seal. The top layer (with the seal) is leak resistant, not the bottom layer. 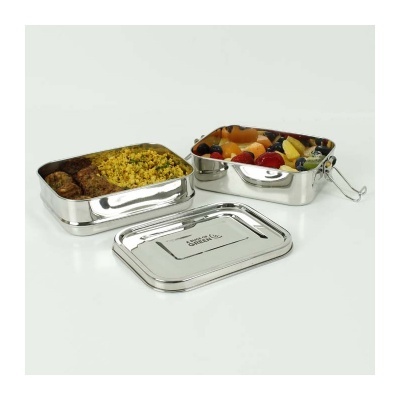 Ideal for taking a waste free 'on-the-go' balanced lunch from home, this stainless steel lunch box consists of two separate tiers so is ideal for taking a savoury salad or sandwich, plus fruit or a snack to work in one neat container. The top layer (with the seal) is leak resistant, not the bottom layer. Features include smooth folded edges, levered locking clips at each end for extra pressure during closure, and a handy silicone seal around the lid which makes it more leak resistant than the standard A Slice of Green containers. Not for use in the microwave. Dishwasher safe. We do not recommend the leak resistant lunch boxes for use in the oven, even with the seal removed. Prolonged exposure to very hot temperatures can cause the metal to distort and then there could be issues with the lid fitting properly.